This book encompasses total fifty chapters as per CCIM's newly framed UG & PG syllabus. It is designed in such a manner that it also stands useful to the diploma courses in Ayurveda pharmaceutics framed by few universities. The wide-ranging concepts of Bhaishajya Kalpana are dealt here in a rational and sincere manner, keeping in mind the interests Ayurveda scholars. This book is categorized into three segments; the first segment is from chapter 1 to 4 which has history & the fundamentals of this science. 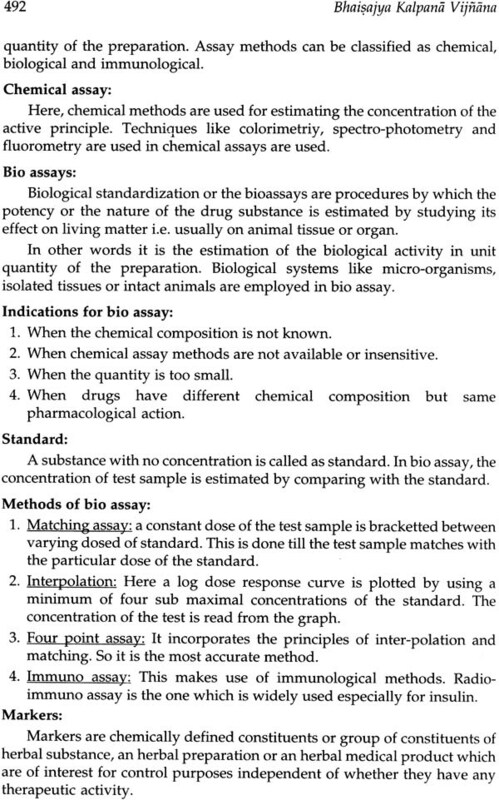 Chapter 5 to 41 is recognized as the 2nd segment which has all the pharmaceutical prepara- tions with their explanations and typical examples. The third segment is considered from chapter 42 to 50 which deals about the modern aspects of the pharmaceutical preparations. RAVINDRA ANGADI M. D. (Ayu) The author completed his under graduation from D. G. M. Ayurvedic Medical College, Gadag, of Karnataka University Dharwad in the year 1997 -98 and post graduation in the subject of Bhaishajya Kalpana from A. L. N. Rao Ayurvedic .Medical College, Koppa, of Rajiv Gandhi University Bangalore in 2003. Since then he is working in the Post Graduation Department of Bhaishajya Kalpana, at S. D. M. College of Ayurveda, Udupi. He is now assistant professor and university recognized post graduation guide in his department. He has presented several papers in different national, international and state level seminars and CME's in his subject Rasashastra and Bhaishajya Kalpana and also in the subject ofDravyaguna. Ayurveda, a divine and complete life science, developed in Indian subcontinent by the great ancient sages. It is the oldest medical tradition of the world. The doctrine of Ayurveda is based on the harmony of sarira-manasa dosas viz. vata, pitta, kapha & sattva, raja, and tama. Equilibrium state of sarira-manasa dosas provides healthy status to the human body, where as imbalance status causes diseases. This status is synchronizing by the nature using materials already present in nature. Nature is the abundant source of all kinds of material distributed into the plant animal and mineral kingdoms Requirement of diet and drug fulfilled from the same. Under the four pillars of successful treatment (catuspada of cikitsa) drug occupied important second position. Drug is a tool of physician. Appropriate drug can only serve the problem. Hence Bhaisajya Kalpana subject was developed. 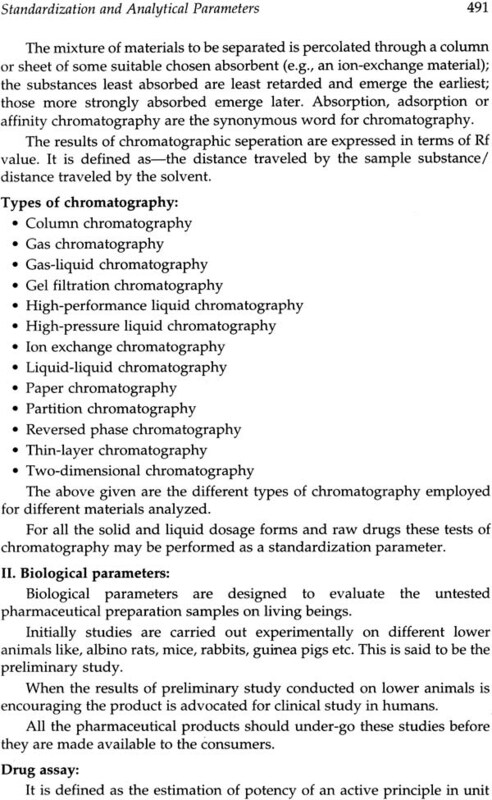 In the curriculum of this subject all the scattered material and factors related with drug manufacturing and dispensing are compiled and frame the syllabi. 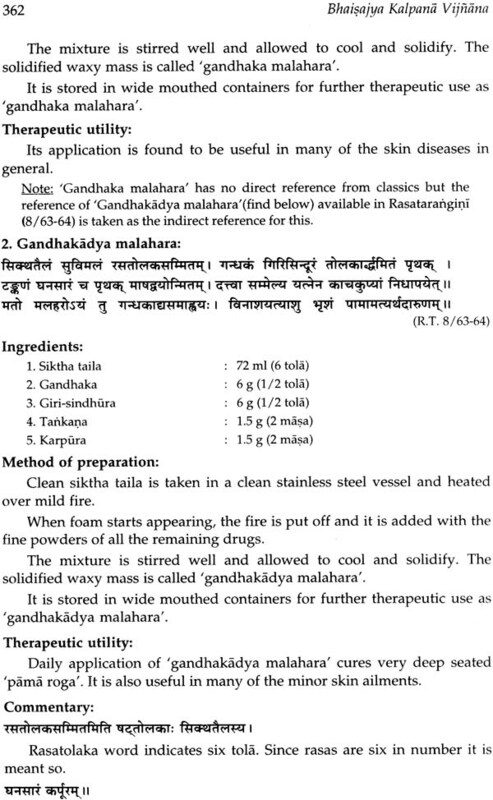 From the historical back ground to chronological development, fundamental principles (adhara-buta siddhanta), weights and measures (mana), anukta-lesokta paribhasa, collection and storage of raw material, basic and their derivatives, anupana, ausadha kala etc. all the topics are included into it. According to Ayurveda, there is no material in universe which can not be used as medicine (nanausadhibhutam jagati kincid dravyamupalabhyate tam tam yuktimartham ca tam tamabhi-pretya. C.S.Su, 26:12). But it should be in appropriate situation and with proper yukti (wisdom). Applying yukti Ayurvedic physician became able to transform natural materials, (plants or animal products or even materials) into easily administrable pharmaceutical preparations. 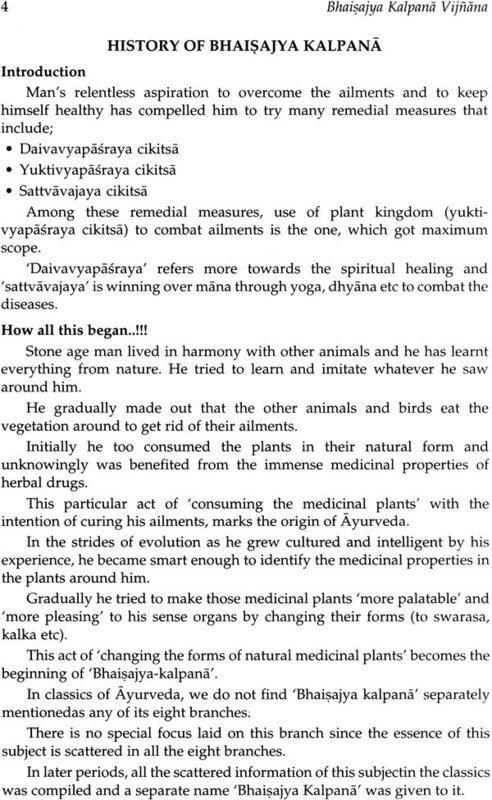 Ultimately a whole new branch of Ayurveda emerged by the name of Bhaisajya Kalpana. A drug material by which physician treat the diseases, or the material which is useful for medicinal purposes, is known as ‘bhesaja’. 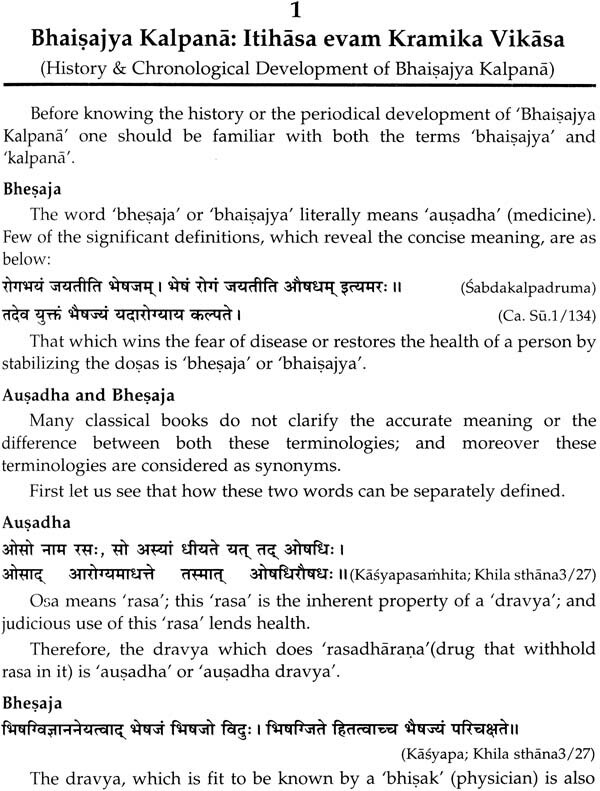 ‘Bhesaja’ and ‘bhaisajya’ are same or it is synonymous (bhesajameva bhaisajyam). ‘Kalpana’ denotes the meaning of planning (kalpanam yojanamityartham). 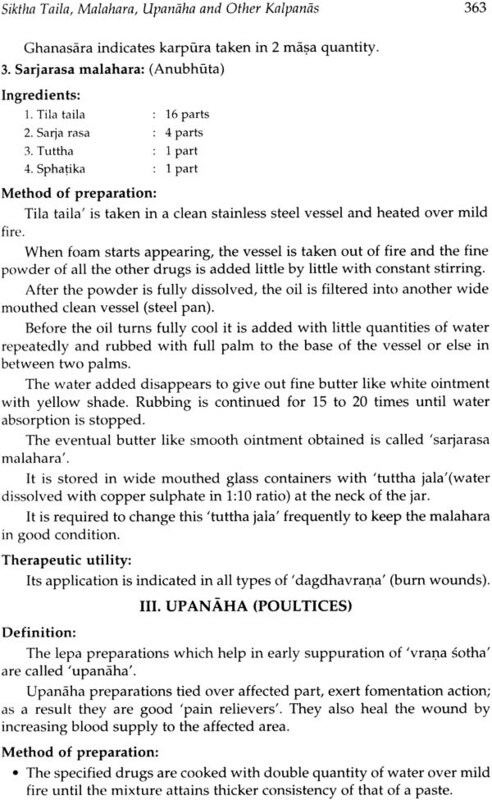 Preparation for internal/external uses/administration (prayogah vividhah) or (sarire prayogartham) is known as ‘kalapana’. Without proper processing of material we cannot attain their therapeutic property. Hence processing of material is essential. Processing of material for therapeutic purposes is known as ‘Bhaisajya Kalpana’. 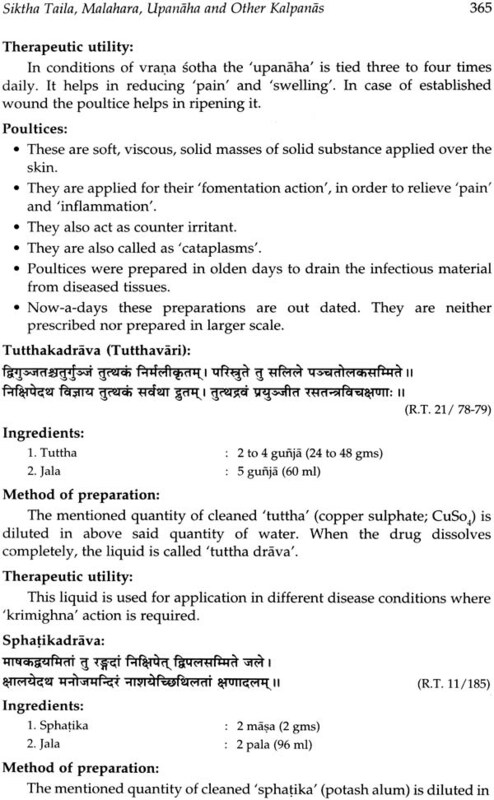 In the developmental stream of civilization, drug manufacturing part of Ayurveda also developed. 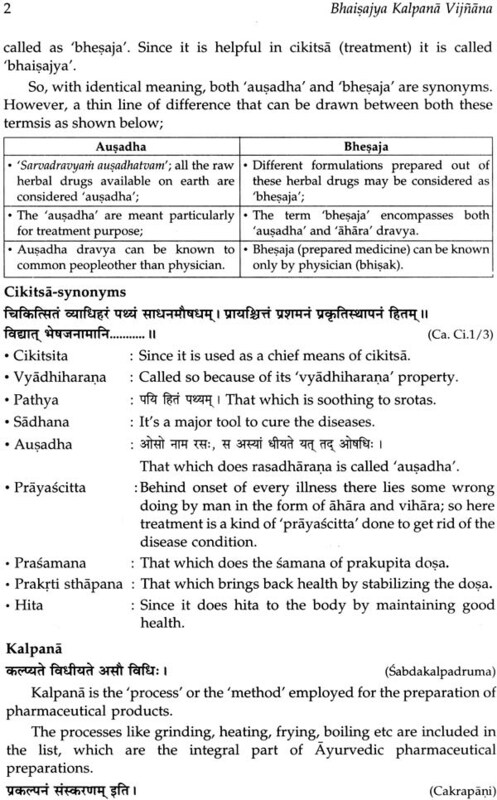 Scattered descriptions of various preparations are found available in Vedic literature. But in Samhita it can be seen in well arranged manner. Whole Ayurveda presented in eight folds known as Astanga Ayurveda’. 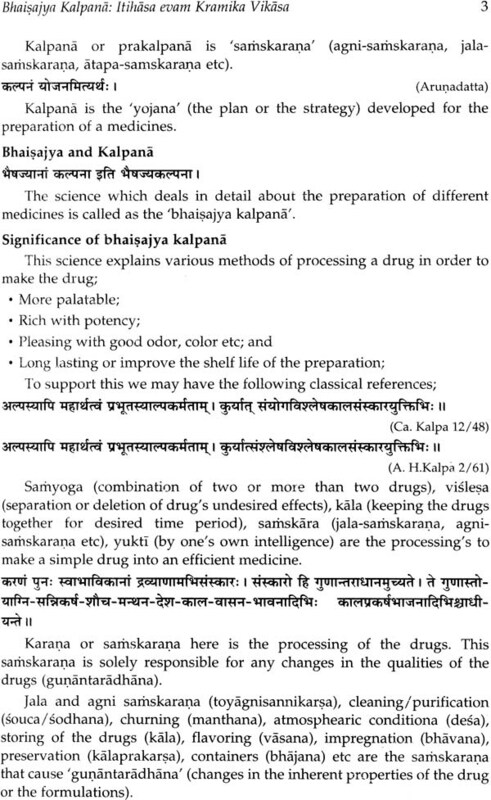 Bhaisajya Kalpana is an art and science of preparing and dispensing medicine. 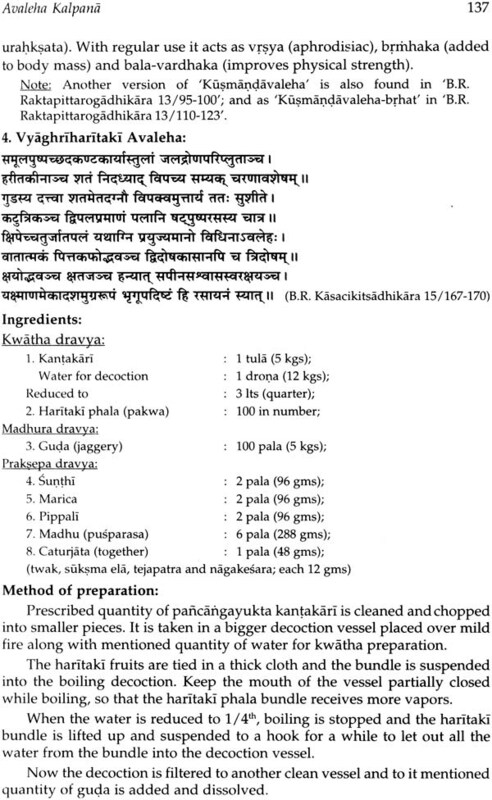 Ancient scholars first able to modify the raw material into the form of swarasa, kalka, kwatha, hima and phanta are put under heading of pancavidha kasaya kalpana. Depending upon this, inn later period, many other formulations were developed to attain ready palatability, longer shelf life, low dose, quick action, easy dispensing and handling. Earlier drug manufacturing was not separately taught. It was a part of Kayacikitsa. Physicians were managing/preparing/formulating and dispensing drugs by him for their day to day patients. But now the scenario has changed. Ayurvedic physicians engaged themselves mainly in diagnosis and treatment. They fully depends upon the market. Market is full of spurious and substandard drugs and with that success in treatment is doubtful. 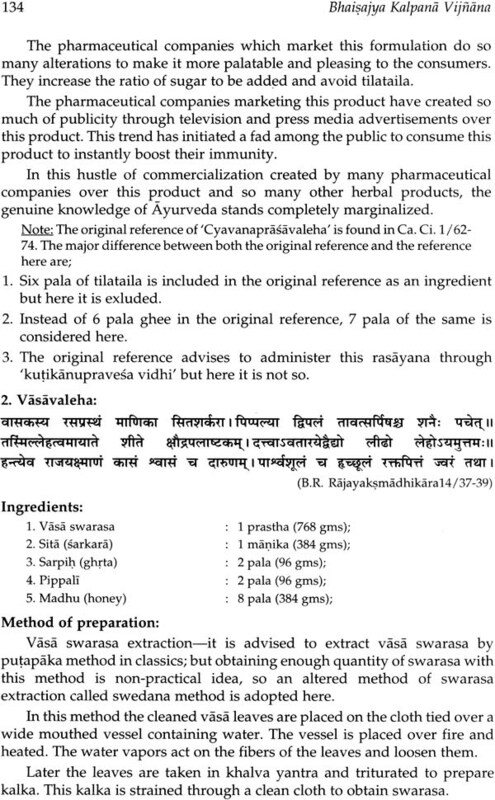 Otherwise Bhaisajya Kalpana subject included in Ayurvedic curriculum with the idea to trained the students in theory and practical of drug manufacturing. But due to lake of interest and facility this part became weaker and unable to create confidence in learners. 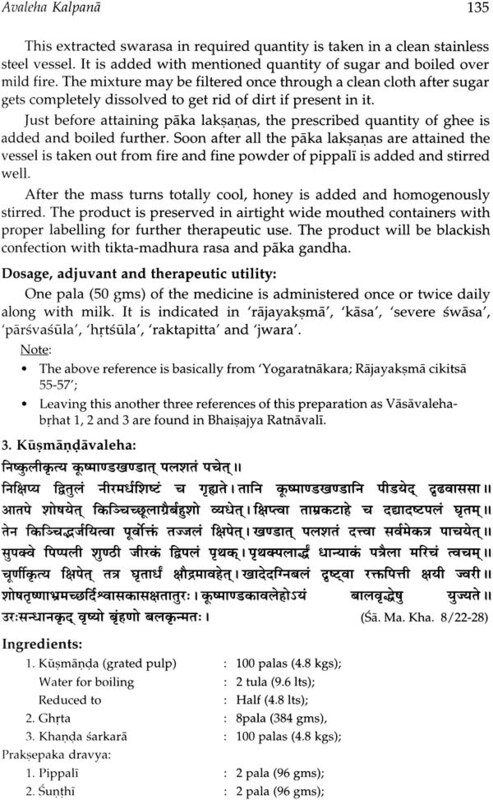 For the success in Ayurvedic treatment Bhaisajya Kalpana part of leaning needs to encouraged. I appreciate this intellectual and multidimensional work of Dr. Ravindra Angadi completed in the form of text book. Author’s intelligence and hard work reflecting in this his own write. In recent past few versions of Bhaisajya Kalpana became available in English. This book will offer a standard, important, useful and popular work on Bhaisajya Kalpana in English. Author has tried his level best in this book to cover the entire BAMS and MD syllabus of Bhaisajya Kalpana recently reviewed by the CCIM. 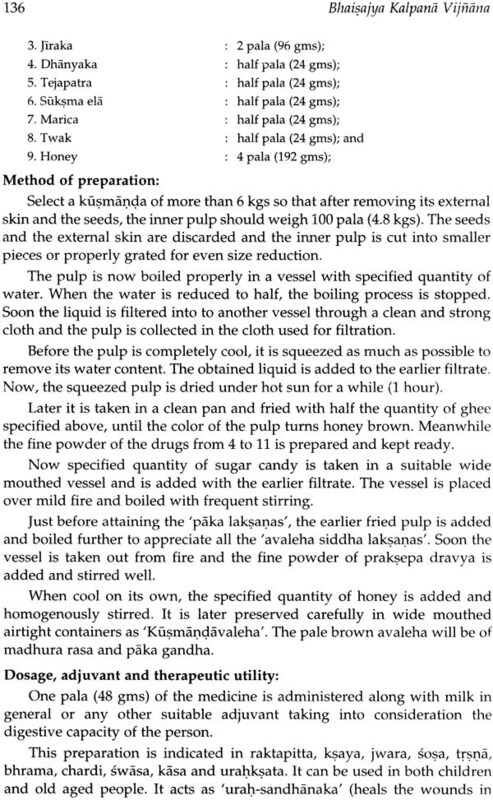 I hope this work will be useful to the students, teachers, and researchers working in the field of Ayurveda and Bhaisajya Kalpana and certainly they will appreciate the way of presentation and its easy language. It is a creditable achievement of the author and I am sure that this book will definitely find a wider appreciation in the field of Ayurveda. I congratulate the young and intelligent author for this literary contribution for the benefit of student community. 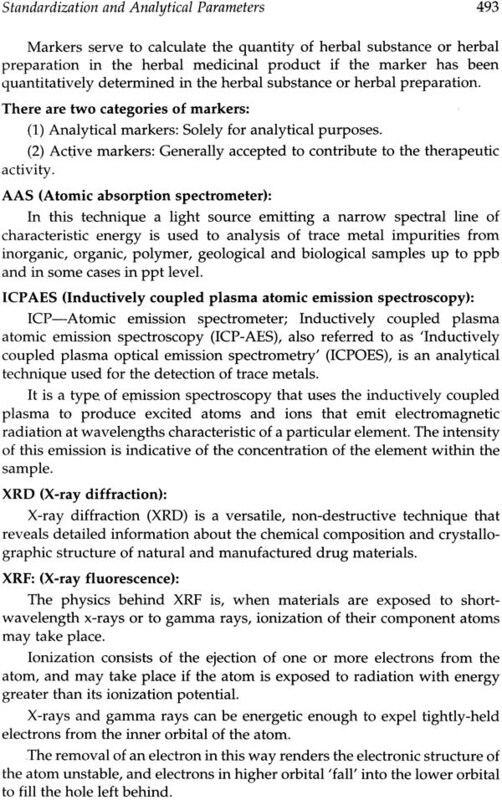 First segment is from chapter 1 to 4 which has History & the Fundamentals of this science. 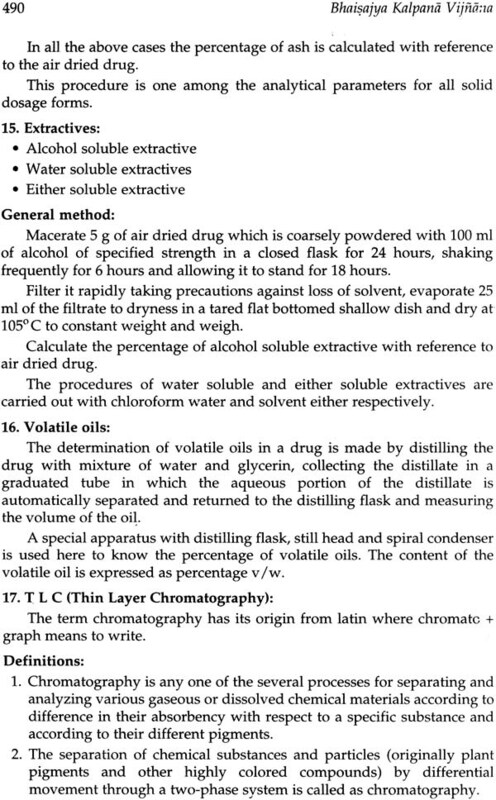 Chapter 5 to 41 may be recognized as the second segment which has all the Pharmaceutical Preparations with their explanations and typical examples. The third segment may be considered from chapter 42 to 50 which deals about the Modern Aspects of the pharmaceutical preparations. First two segments are crucial for both UG & PG scholars. Third segment will be an additional knowledge for UG students but again essential for PG scholars. I have earnestly tried to keep the concepts simple to the possible extent for the better understanding of all the under graduate, post graduate and the diploma student fraternity of ayurveda. I sincerely believe and hope that this work will serve the needs of student community. I welcome the thought provoking suggestions for further elucidation of the concepts explained. At the completion of the task of writing this book, I remain humbly grateful to all the individuals who have played a role in making it possible. At the beginning I would like to convey my humble thankfulness to the President of our institution Rajarsi Dr. D. Veerendra Hegde, Vice President Prof. S. Prabhakar, Secretary Prof. Yashovarma & the management for blessing me with an opportunity to serve in their institution, which is the source of inspiration in this work of mine. I am extremely grateful to our beloved principal Prof. U.N. Prasad, for his warm hearted support and blessings in accomplishment of this work. My heartfelt thanks are with Prof. C.B. Jha for appreciating the book and taking out his precious time to pen foreword for this work. My respects are with all the senior staff and colleagues of our institution for their kind suggestions all through. I am especially thankful to the seniors and colleagues of my department RS & BK, Prof. Yeriswami, Prof. Prabhakar Renjal, Prof. Rajashekhar Pande, Dr. Shekhar Reddy, Dr. Sujatha K., Dr. Seema M.B., Dr. Sudheendra Honwad and Dr. Ashok B. N., who heartily supported and contributed in clarifying many controversial points of the subject. My thanks are with the earlier pharmacy manager Prof. Siddhinandan Mishra, Present Manager Dr. Muralidhar, Assistant Manager Dr. Mohanan and pharmacy staff for their help and support. My respects are with Prof. Damodar Pande, Prof. Damodar Reddy, Prof. Vilas Dole, Prof. R. S. Sarashatty, Prof. Ramesh Harwalkar, Prof. P.K. Prajapati, Prof. Ashmita Wele, Prof. Shobha G. Hiremath, Prof. M.C. Patil, Prof. K. Ramachandra Reddy, Prof. B. B. Joshi, Prof. Dinesh Kumar Mishra, Prof. G. Unnikrishnan, Prof. K. T. George, Prof. Shivadas, Prof. S. Sasikumari, and Dr. Vishi Bansal, Dr. N. Vimala and Dr. Jacob Titus with whom I have exchanged my views about the subject at different instances. I also humbly remember at this point in time my friends Dr. Jayan N., Dr. Chandrakanth Samaj, Dr. Ajit, Dr. Vijay Sopimath, Dr. Sapna, Dr. Sudheendra, Dr. Sudha, Dr. Kannan, Dr. Seenu, Dr. Manoj Kumar Samantharaya, Dr. Bheemasena Deshpande, Dr. Jagadish Mitti, Dr. Shivanand Patil, Dr. Sanjay H. Y., Dr. Ravishankar Chanakya, Dr. K. S. Kuchunur, Dr. Subhash Bagade, Dr. Ashwin Kumar Bharati, Dr. Manjunath Naik, Dr. Mahesh Bhat, Dr. Ramesh N. V., Dr. Rakesh D. N., Dr. Purushottama, Dr. Clarance Davy, Dr. Vishvanath, Dr. Nagaraj, Dr. Roshan Doddamani, Dr. Nitin Kumar, Dr. Praveen Rao, Dr. Shreedhar Gokhale, Dr. Sudheera, Dr. Soumya, Dr. Priyadrashini, Dr. Parthiban and Dr. Jaiprakash for their yielding debates at different instances on several topics of this book. At this sage, I respectfully remember all the teachers of D. G. Melmalgi Ayurvedic Medical College, Gadag and A. L. N. Rao Ayurvedic Medical College, Koppa, who taught me in my UG & PG days. I am also filled with warm memories of all my friends of UG & PG days at this point in time. I am pleased with the UG & PG scholars of our institution since 2003 for the dedication & concern they have shown towards the subject I deal. I am thankful to all the library and digital library staff of our college for their help in providing the needed referral stuff for this work. My love & respects are with my wife, parents, sisters & their families for their unconditional support.